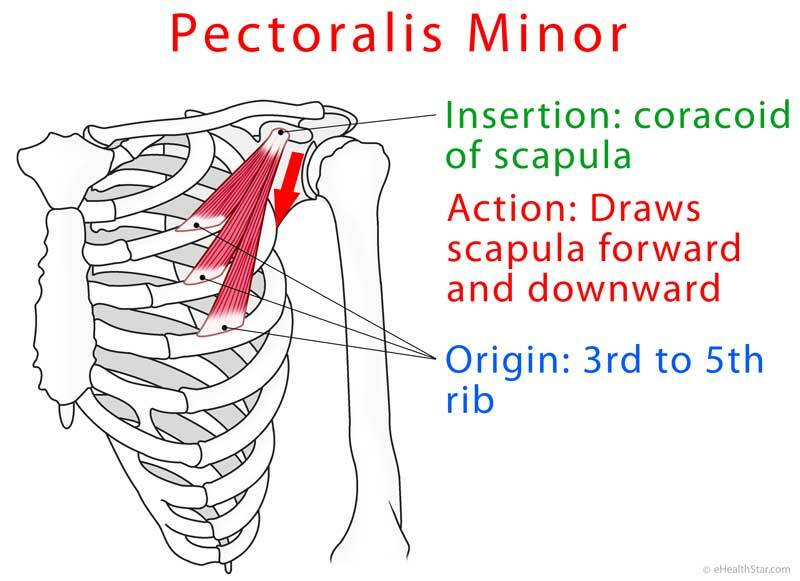 Pectoralis minor muscle extends from the front side of the upper ribs to the top of the shoulder blade (scapula). Acute pain in the pectoralis minor can be caused by muscle contusion, strain or tear. Chronic pain (myofascial pain) in the pectoralis minor can develop after a car accident, using crutches, carrying a heavy backpack, severe coughing, anxiety, poor posture with a bent head and rounded shoulders (Video 1). Raise an arm sideways by about 120 degrees and then try to move it down toward the opposite hip against the examiner’s resistance (Video 2). Decreased strength of the pectoralis minor (as opposed to the other side) speaks for muscle strain or tear.